The throne bears a ring to suspend the instrument. The limb is divided from 1 to 24. Eighteen stars are indicated on the rete, some by means of protruding points, others only by their names. On the zodiac circle are the names of the signs in Latin, some of which are abbreviated. The back of the astrolabe is marked with the divisions and names of the signs of the zodiac (in Latin) with certain peculiarities. For example, the sign Pisces is written as 'PISSES'. Some names are abbreviated. The names of the months are also give in Latin, again with certain idiosyncrasies. For example, the letter N is frequently reversed, and the letter S is reversed in the word 'MARCIUS'. 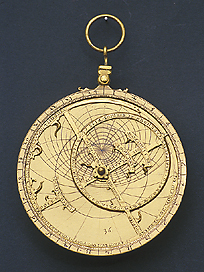 The half shadow square occupies the lower half of the back of the astrolabe. It bears no markings, except for rough divisions 3 to 6 to 9 to 12. The lower half bears the hours, marked 1 to 12. The face of the instrument is completed by a non-graduated pointer, equipped with sights. The mater, which has no inscriptions, contains three plates, calibrated for the latitudes 40 and 45?, 42 and 36?, and 50? with a polar projection. See M. Miniati, Museo di Storia della scienza: Catalago (Florence, 1991), p.8.